Europest falconry services are non-lethal deterrent program that can deal with pest bird’s species in a natural and humane way. Using Europest birds of prey we can alter the behavioral patterns of pest bird’s species. Our specialist team of falconers can direct our birds of prey towards flocks of pest birds in problem areas. Doing this instills fear, which causes the pest birds to be disorderly and vulnerable. The presence of a bird of prey causes pest birds to nest away from previous problem areas. Falconry bird control programs are long term as they necessitate constant flying of the bird of prey in the problem area over a series of months in most cases. Once the pest birds have moved on and the birds of prey are known in the area, flying of our birds of prey will be less frequent. The type of birds we use will be governed by the type of pest birds and location of the problem area. Sometimes the bird pest species is only a problem during the breeding season. Meaning that, our falconry services will be required from April to July (whilst the birds are nesting). Our falconers also take care to ensure that we use the correct bird of prey for the particular job. Harris Hawks – are used for indoor work where space is limited. These are large hawks with long tails and broad wings. Harris’s hawks range in length from 18 -23 inches and have wingspans of 40 – 47 inches. The speed of the Harris hawk at its max is about 45mph but seldom do these speeds. Peregrines normally grow to 15 inches in length with a 40-inch wingspan. 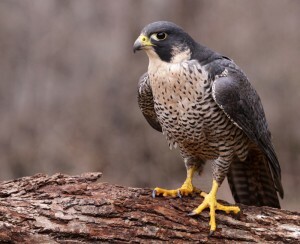 The speed of a peregrine has been said to reach 175 miles per hour or more. Experiments conducted by scientists put the bird’s diving speed at approximately 200 miles per hour and level flight at approximately 62 miles per hour. 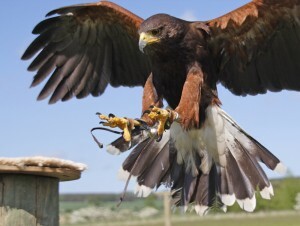 All our birds of prey are bred and trained specifically for use in the pest control industry. Our birds of prey are used to flying in commercial, industrial and areas of heavy urbanization. The welfare of our birds is extremely important and we ensure that all birds are exercised daily and fed on a nutritionally balanced diet. Our falconers have years of experience in this area and have extensive training in all aspects of falconry bird control.